A:There are 20-23 petals are in a cup. We would recommend a 10-cup package. Petals do not go bad, but may alter in color over time and air exposure; please enter a desired delivery date of up to 2 weeks prior to your event to ensure optimal condition of this item upon delivery. 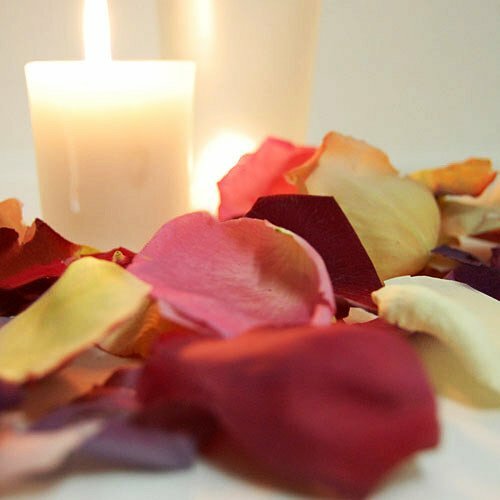 Keep your event details looking fresh and fabulous with these freeze dried rose petals. Each freeze dried flower petal is plucked from a premium rose at its peak freshness. The result? Frozen flower petals that can look fresher than those you picked from your garden this morning! Flower petals come in a variety of single colors and specialty color blends. Please note that since this is a natural product, colors may vary slightly. Unlike fresh petals, freeze-dried petals will not wilt or stain clothing. Perfect for decorating or tossing-indoors or out. Package in our sheer organza bags or favor cones to give as party favors. Petals are sold in the following package sizes: 10 cups, 20 cups and 60 cups. For tossing, please allot 0.5 cup of petals per guest.